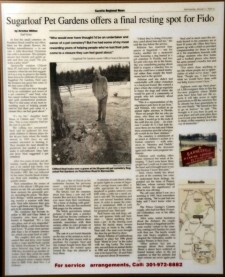 Barnesville resident Clifford Neal, 87, had never heard of a pet cemetery when his son first suggested it as a way to preserve the family farm, but as he celebrates 20 years of Sugarloaf Pet Gardens, Neal says the business has given him some of the best years of his life. The calling was unexpected. Neal said he gathered his four adult children to discuss plans for the 46-acre farm where the family moved in 1970 since no one seemed interested in farming it. They decided the land should be preserved, but needed a way to make it self-sufficient. Days later son Jerry Neal suggested a pet cemetery. 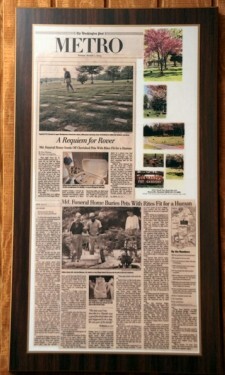 After two years of tests and obtaining county permits, the first pet, a dog named JoJo Steele, was buried at Sugarloaf Pet Gardens in December 1983. She was followed by her sister, Suzette Steele in January, Neal said, standing over the granite stones. Neal remembers the stories of many of the almost 1,500 pets now buried on site. He can nearly recite from memory his graveside service, including the poem “The Rainbow Bridge,” which assures grieving owners a reunion with their pets. Neal tells listeners their pets were a gift from a loving god. “This gets to be emotional,” he said. The couple’s first pets, ferrets named Ben and Jerry, were buried under a crepe myrtle bush outside the Sebok townhouse in 1997, but when beloved Dog Lupi died in 1998 they decided to go another direction. Now they await the tomb stone of Felix Goldman, a cat who was adopted when a family friend died in 2000. Felix died Nov. 4 of diabetes. “We put a Star of David on his tombstone because his previous owner…was Jewish even though we’re not,” Bill Sebok said. The Seboks visit the cemetery about four times a year and will transfer Ben and Jerry there if they ever move from their townhouse. “It’s a form of dealing with grief,” said Sebok, who also has memorial web pages for the animals. The Sebok gravestones feature pictures of their pets, a practice Neal said has become common in recent years. Many markers show animals, sometimes with their owners, either in color pictures on ceramic or in black and white on metal. Neal buries cats, dogs, rabbits, iguanas, birds and hamsters—“about anything that’s been a pet.” Mindy Felinton of Gaithersburg planned to place her 1996 photo book “Mutts in Love” in the casket with her dog Lucky. Felinton has reserved four spaces at Sugarloaf…She was considering buying a cemetery tree so she could have a raised memorial rather than simply the headstones laid in the ground…She wanted a place where she could go regularly to honor the dogs and where she would be part of a community of people who felt similarly about their animals. Neal, whose family has about six pets at the cemetery, has come to understand those feelings…Patrons feel just as strongly about their animals. About a dozen have scattered or buried human ashes in the pet cemetery so that the animals and their owners are never again parted. Neal said in most cases the animals buried in his cemetery are at least 10 years old. Often they have grown up with a child or provided companionship for those in need of it. “I’ve never done anything in my life where people are so appreciative of what we’ve done,” said Neal. “People say, ‘I don’t know what we would have done with our baby if you weren’t here.’” Eighteen years ago Neal planted 1,100 evergreen trees to line the five acre property where 30,000 plots have been laid out. He expects it will take seven or eight generations to fill the cemetery, but he already has four generations in his own family. “We intend for this to go on forever,” he said…I like to think of this cemetery as a treasury of memories.